The Rocky Mountain National Park is one of the worlds largest national parks clocking in at 265,769 acres (358 square miles). The primary path through the park is called Trail Ridge Road, and connects Grand Lake Colorado and Estes Park Colorado. 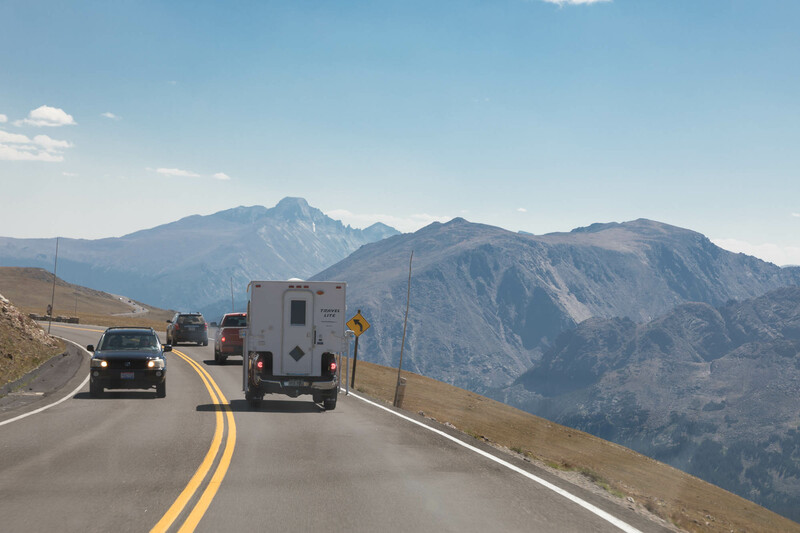 As it meanders through the park, Trail Ridge Road rises to an altitude of 12,183 feet, and along the way you will find plenty of places to pull of and appreciate some of the most spectacular scenery in the world. The park is open 24/7 so feel free to enter the park in the late evening for some sublime star gazing opportunities. I can’t see enough detail to appreciate stars, but the times we have ventured into the park later in the evening for stargazing have provided gasps of astonishment from those with me who are fully sighted. The park has 5 campgrounds with 585 camping spots, however given that the parks averages 3 million visitors a year, camping spots can be difficult to come by. 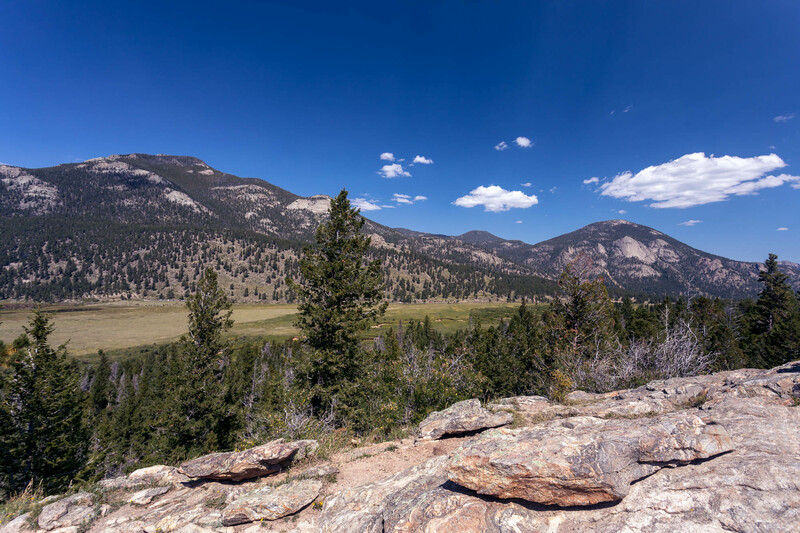 If you aren’t lucky enough to score a camping spot in the park, there are a number of places to stay in Estes Park, just outside of the park – or if you want to drive for an hour, the eclectic city of Boulder is a great place to visit. Because of the sheer magnitude of attractions to visit in the park, a single visit and review could not do this park justice. I plan to update this article as I get more time in the park. How does Rocky Mountain National Park fare when considering the needs of visually impaired visitors? The short answer is – not too bad, the longer answer follows. Visitor notes: After numerous visits to Rocky Mountain National Park, the most important piece of advice I can give you is get there early. Parking lots fill up quickly (even the accessible parking), and you can find yourself having to park quite a ways from your desired attraction, and be required to take a shuttle bus. Parking is always difficult to find, with the exception of Winter. Fall Summer and Spring are very busy in the park. If you arrive at 9 am expecting to find a parking spot near your desired attraction, be prepared to be disappointed. Materials such as maps are also available in large-print and/or braille at any visitor center or entrance to the park. Take a moment to communicate that you have a vision problem when interacting with any p[ark staff and you will find them to be very accommodating. They will happily describe scenery or attractions around you, I found them very helpful. I have been to Rocky Mountain National park a few times, and mainly stuck to the Trail Ridge Road, as that is likely the most iconic path to traverse by car, featuring many accessible parking spots along the route. From the National Park Service Website, here is a listing of the Trail Ridge Road pulloff spots with accessible parking. No accessible parking or curb cuts. No accessible restrooms. No picnic tables. 1/8-mile boardwalk has moderately steep grade. Covered picnic pavilion; accessible picnic tables. 400 feet of paved accessible trail. No restrooms. No picnic tables. Cross Trail Ridge Road from the west parking lot to the boardwalk and the steep trail to the overlook. The east side of Trail Ridge Road is plowed to this overlook in winter. Curb cut and sidewalk make area accessible. Paved trail to platform at overlook is uneven and steep in places. Accessible parking with curb cuts to sidewalk. The ½-mile paved trail is steep and uneven. Accessible parking spaces. No picnic tables. Accessible restrooms (vault toilets) all season and summer (flush) at east end of visitor center. Open Memorial Day weekend through Columbus Day, weather permitting. Visitor Center information desk is accessible to wheelchairs. Trail to Lake Irene is steep and has steps. The west side of Trail Ridge Road is plowed to this point in winter. Picnic tables not accessible. Trail is not accessible. Accessible parking but parking lot is unpaved. Wheelchair and motorized wheelchair-accessible ½-mile gravel path to historic site is steep in places. In summer a staff-operated golf cart can take visitors to the site. Interiors of historic structures are not wheelchairaccessible. Walkways around the several buildings are rough and unpaved. Picnic tables are not accessible. Accessible parking. Accessible restrooms (vault toilets). 1-mile level-grade packed gravel trail; use of gloves may be helpful. The 2 accessible picnic tables are in a covered pavilion. Packed gravel path from parking area to picnic area is sloped. 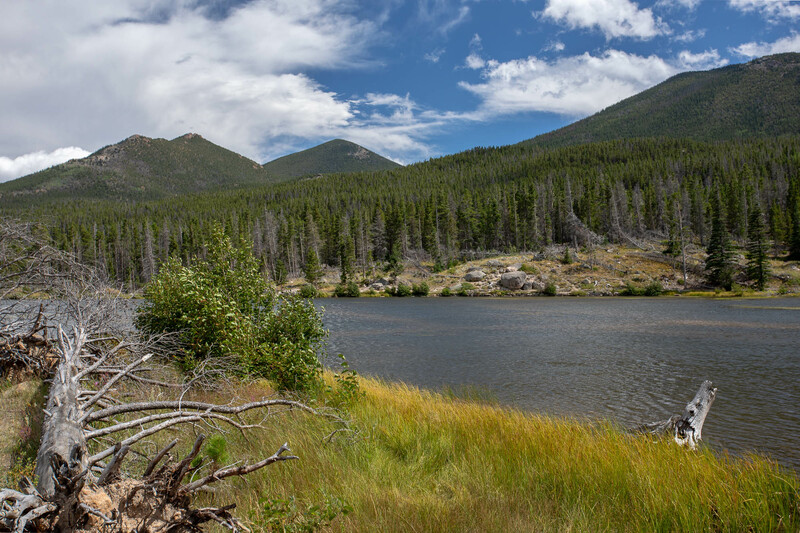 Since we live near Denver, we entered the park from the Estes Park side (the east side of the park) on our most recent trip, we decided to check out the Bear Lake area of the park. We were scouting areas for an upcoming fall colors photo outing, and this seems like a great place (I will report back after the trip). We started at Bear Lake, which has a very large accessible parking lot. The Bear Lake Trail is the only Accessible trail in the park, and the entire trail isn’t mobility-restricted friendly. From a visually impaired standpoint, Bear Lake Trail was easy difficulty in terms of navigation and in-path obstacles. The flat areas which were suitable for wheelchair access were smooth and devoid of obstacles. Around the back part of the lake there was some loose gravel and stairs, otherwise the area was very accessible. The views are spectacular. 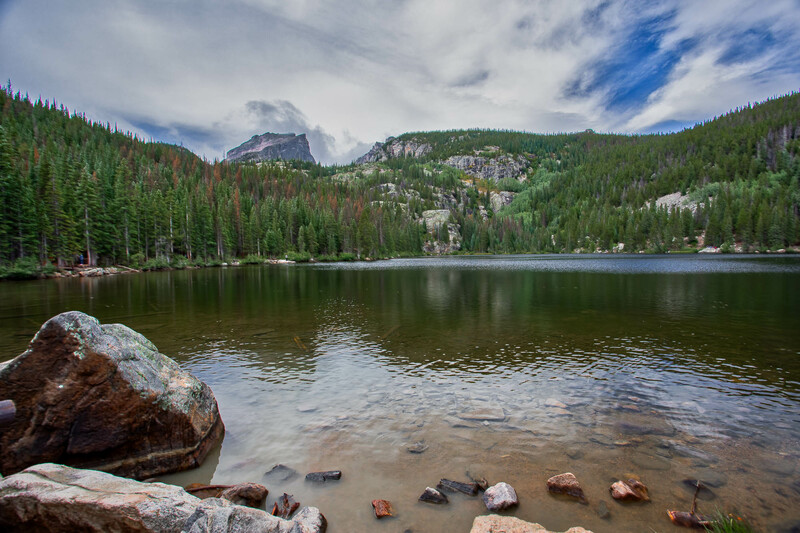 The lake is located at 9400 feet, so be ready to breathe a bit heavy even if you are in good shape. The Bear Lake Trail is located about 250 feet form the large parking lot, so it is easy to get to. There are accessible restrooms in the parking lot which were brightly lit and easy to navigate with low vision. The restrooms are unisex, so you don’t have to worry about discerning which is for men and women. 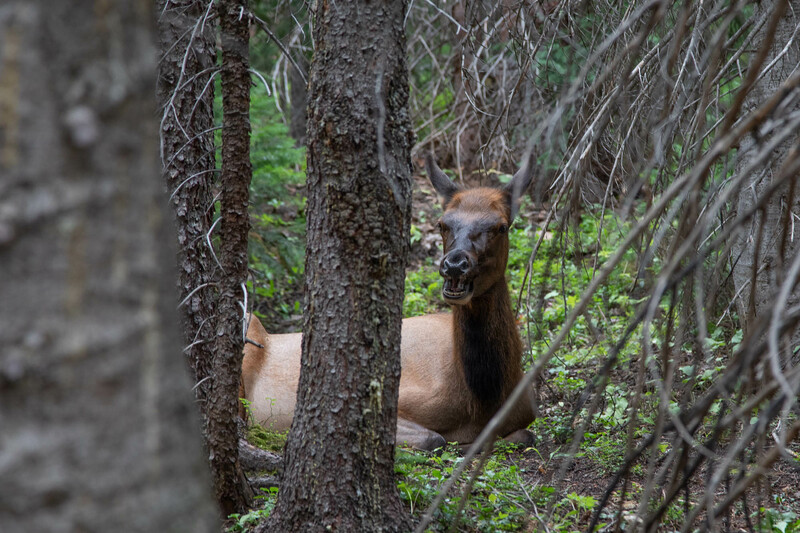 According to the National Park Service, hundreds of species of animals inhabit Rocky Mountain National Park, including moose, elk, deer, bighorn sheep, cougar, bear, fox, bobcat, marmot, beaver, porcupine, and badger, among others. Several species of fish, including 4 different species of trout, inhabit the park’s lakes and streams. Combine this with the 282 species of birds that visit or inhabit the park and it is easy to understand the numerous warnings around the park for wildlife. It should be mentioned that these are wild animals, and should be given their space. I understand the temptation to get close so you can see them, but they are wild animals and can be dangerous. Be advised that park trials contain hazards including loose gravel, uneven surfaces, rocks, tree roots and steep areas. We started at Bear Lake, and took the Glacier Gorge Trail to Alberta Falls – a little over two miles round trip. The trail was very well marked at the trailhead by Bear Lake, and was an easy/moderate hike to Alberta Falls. This is a good time to mention the other important tip for hiking around the park – be prepared. Even though it was the middle of August, a storm passed through right after we started our hike, which made things very slippery and cold. We had ponchos in our packs, and boy was I happy we did. It didn’t help much with the cold, but at least we were dry, well except our feet (we were both wearing tennis shoes). The numerous rocks in the middle of the path became slippery and even more difficult to navigate, so I consider this an easy/moderate hike for a low vision visitor for that reason. In regards to preparedness, make sure you have water. Hiking at higher altitude than you are used to will dehydrate you quickly. Despite the rain, we did see the Elk pictured above on the trail. There were quite a few people walking along the trail, and there was a myriad of tree roots, rocks and uneven ground to traverse. On this outing, I didn’t bring my white cane, rather, I opted for a pair of good quality walking sticks with rubber tips. These were invaluable in determining the height of an area before stepping down off the rocks in the middle of the path (as you would with a white cane). We hiked to the falls and rook a few photos then headed back. Be aware that the altitude will be a factor even if you are in good walking shape (and live near Denver) like I am. I loved this short hike and would absolutely attempt it again. Take it slow, plan extra time and enjoy being in nature. If you are full blind, be sure to have your sighted guide describe the wooded areas along this beautiful walk. I would rate this hike at a 5/10 for low vision and 6/10 for fully blind visitors with a sighted guide. I would not suggest attempting solo navigation of this path with a white cane unless you are very adept. This hike was well worth the time. 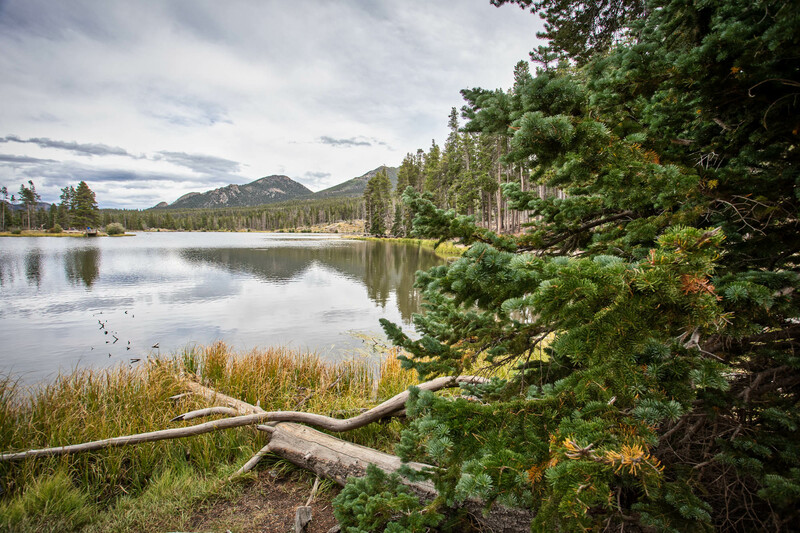 The hiking path that encircles Sprague Lake is suitable for wheelchair access, and is easily navigated by those of us who are visually impaired. The path is generally flat, with few if any steps. The views of the Lake and amazing, but when you add the glaciers you can see (even in August) on the mountains in the background, this is a phenomenal trail accessible by all. The altitude is 8600 feet, so not as taxing as the Bear Lake Trail, and there are numerous places to sit and take an introspective moment in this beautiful park. 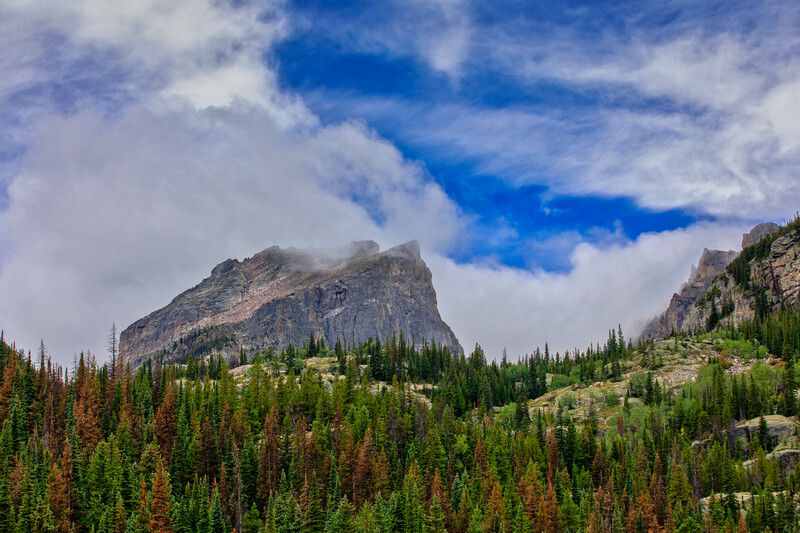 This review only encompasses a couple of the areas in the Rocky Mountain National Park. Overall, the non-accessible trails are certainly not accessible for wheelchairs, but the ones I have ventured onto as someone who is visually impaired weren’t too difficult to travel on. Taking your time and appreciating the world around you will also give you the time to safely navigate the trails. Be sure to check back, I will update this article as I get more information on other areas in the park. You can find maps, and resources for the trails in this article in the resources sections below. Note: all photos are mine and copyright, they may not be used without permission. 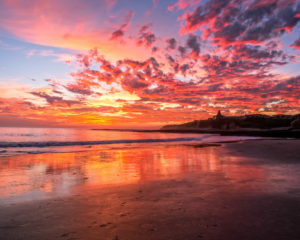 Information used from the National Park Service websites are for viewer education purposes and are cited accordingly.